1.Preheat oven to 425°F. Wash and dry sweet potatoes and cut into 2″ wedges. 2.Put the wedges, cornstarch, paprika, salt and pepper in a large plastic bag and toss to coat. 3.Arrange sweet potatoes, being careful not to overlap them, on a large rimmed baking tray. Drizzle olive oil on each wedge. 4.Bake for 30 minutes, or until edges are brown. 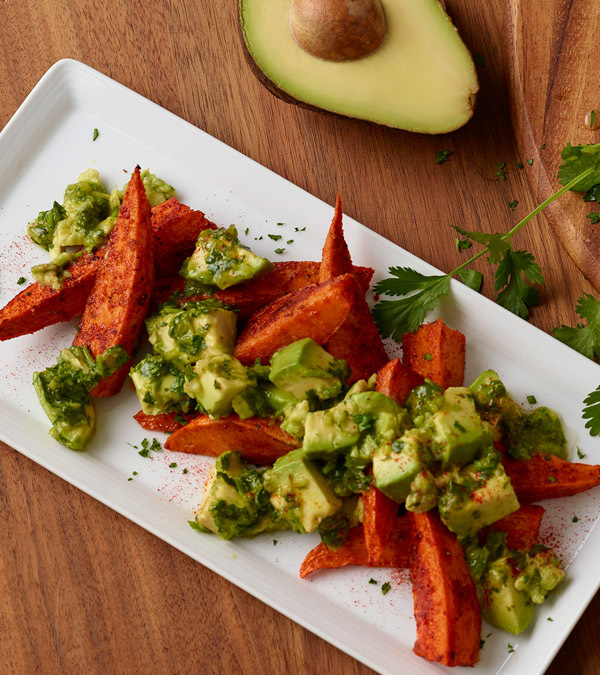 Serve warm with California Avocado Chimichurri for dipping. 1.In a food processor, combine the shallot, green onions, garlic and salt. Process until finely chopped. Add the jalapeno and pulse until chopped. 2.Add remaining ingredients except avocados, and pulse until roughly combined. 3.In a separate bowl, roughly mash the avocados, adding spoonfuls of the chimichurri blend until seasoned to taste.